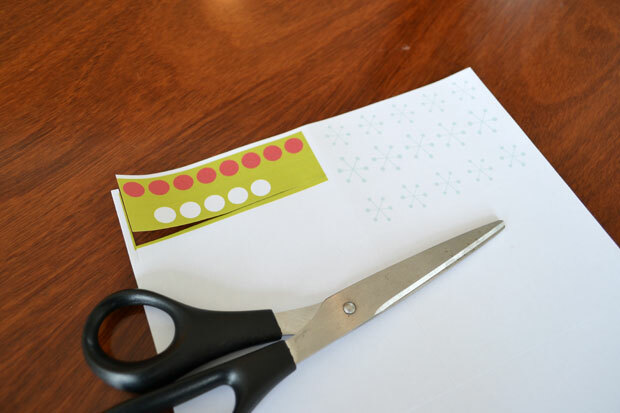 I have a polka dotty DIY project planned for the weekend! So I thought I’d share a bunch of inspiration that’s out there for a range of projects, should you find yourselves with a few spare minutes and polka dots on the brain this weekend. 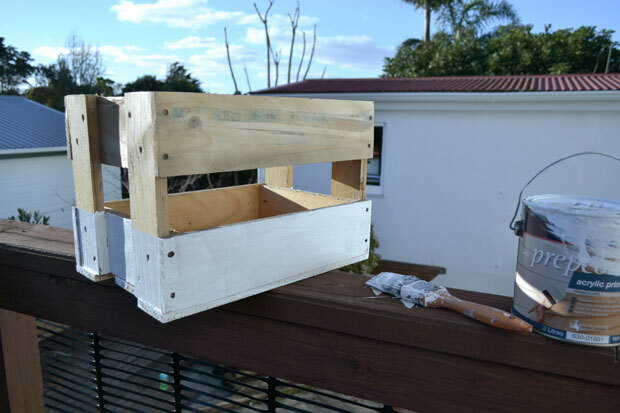 I’m doing my take on one of these projects – can you guess which one?! 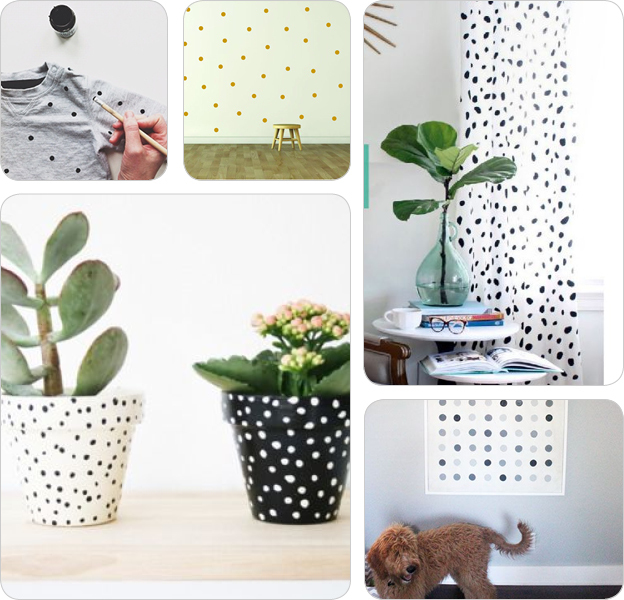 Revamp an old tee, let loose on your walls, put spots on your curtains, DIY some easy art, dotty pot your plants. This entry was posted in Craft, DIY and tagged craft, diy, polka dots, project, quick and easy, weekend DIY on March 28, 2014 by Jolene. 20 days to Christmas! We know it’s coming, we wait in anticipation most of the year, but still… bam! Suddenly it hits. That mad rush that is Christmas. And for those of us in the southern hemisphere, it’s also our biggest holiday season. Even though most businesses and tradespeople shut up shop for a mere couple of weeks, this time of year seems to create a frenzy of “Oh no! If I don’t get it done NOW it’ll NEVER get done!” Or is that just me?! So amidst that, it’s nice to celebrate in simple ways. I’ve just whipped up the easiest advent calendar you may ever come across. If 5 days late guilt is setting in, don’t fret. This DIY advent calendar requires nothing more than a couple of pieces of paper, some crayons or pencils, scissors and Blu Tack. Oh and washi tape! Or, if you prefer digital over pencils like I do you’ll need design software (or just email me with a pretty please and I’ll be happy to send you a printable version of my design) and a printer. 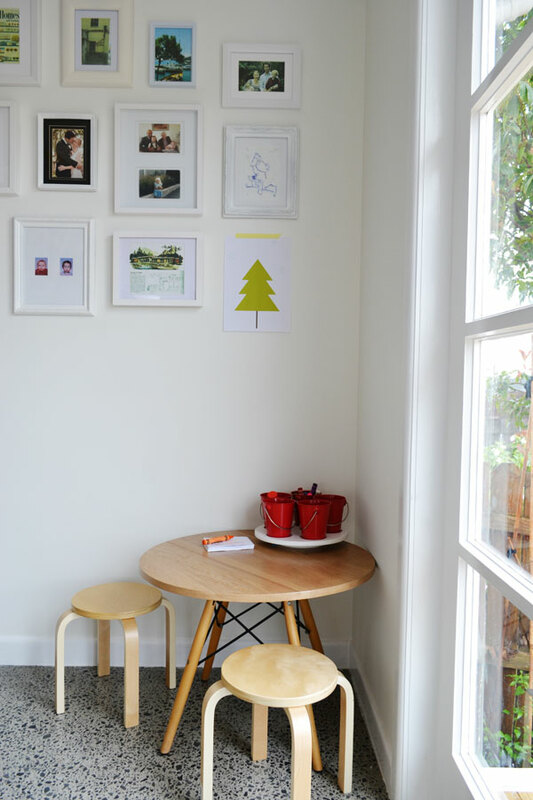 On your first piece of paper draw (or print) a sweet l’il Christmas tree. Easy peasy – three stacked triangles on top of a stick. Add a few snowflakes, reindeer or elves if you feel creative! On your second piece you’re going to draw (or print of course) some ornaments and/or more snowflakes et al. 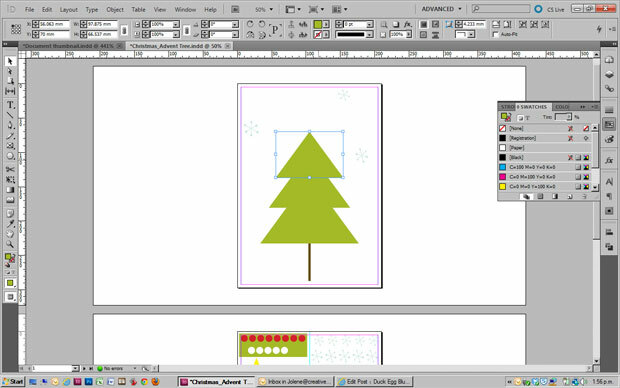 In Adobe InDesign I quickly drew up my tree and a few decorations. 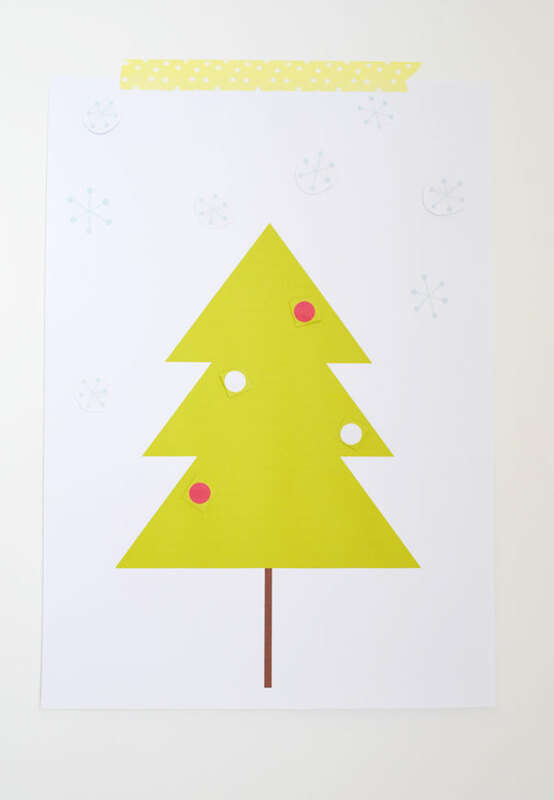 I printed the tree on regular printer paper, but the decorations I printed onto some adhesive labels so they’d be easy to stick onto the tree (more on that in a minute). The most tedious part was cutting out the decorations, but it only took a few minutes. You can see I put a green colour block behind my tree ornaments because I really didn’t feel like taking an hour to cut carefully around each mini circle. 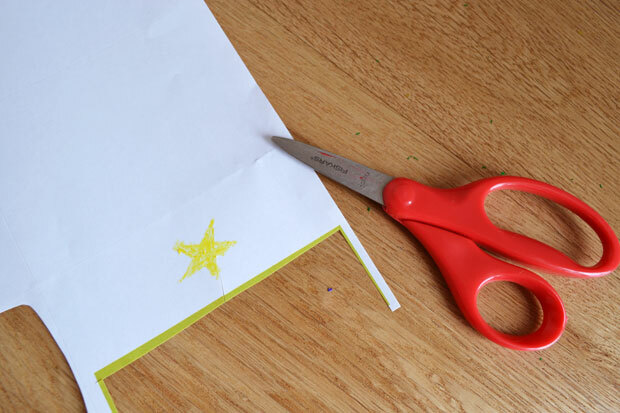 This way I can cut roughly and the green edges will just blend into the tree – smart cheating! I also didn’t count out exactly how many “stickers” I was printing (other than to check there was plenty enough) because I figured I’d use any extras to get the tree started, especially since we are a few days late already! I scribbled up this star as an afterthought, but definitely a necessary one! 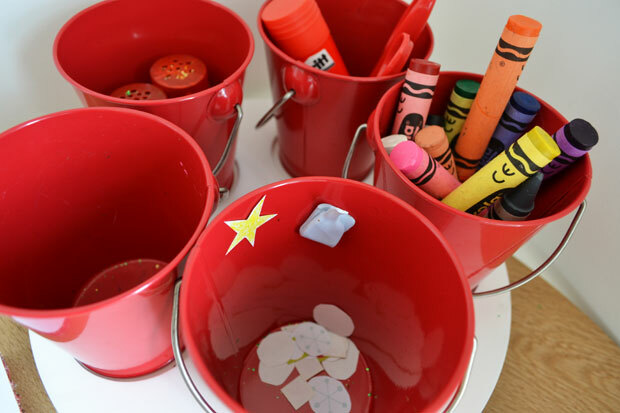 Here are all the stickers in one of the buckets on the kids turntable, along with some blu tack because it turns out those adhesive labels are well stuck to their backing and it would be impossible for the kids to prise them apart. We’ll save the star until the very last! Here’s Master W choosing his first sticker. And putting it up on the tree (after I’d got a head start with the few extras, leaving just enough in the bucket for the remaining days until Christmas). It’s a sweet little calendar for those who like to keep it simple, and just perfect for little ones who might find the gift-giving season a little overwhelming. Sometimes the smallest of responsibilities, and the excitement of watching the stickers get used up are treat enough for toddlers and preschoolers! I hope this helps if you’re running late for Christmas already! 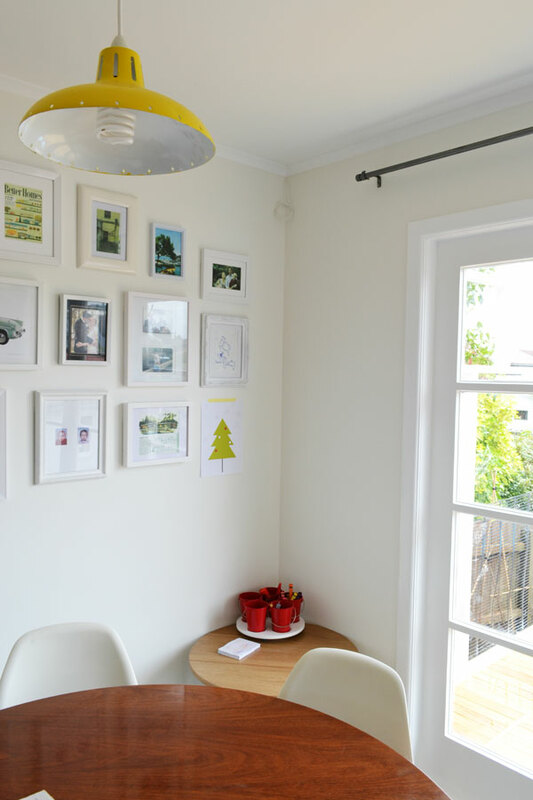 Amanda from Homely One has another lovely DIY advent calendar idea which I’m totally going to be organised for next year…! Promise! This entry was posted in Craft, DIY, Family, Our Renovation and tagged advent calendar, christmas, diy, kids craft on December 5, 2013 by Jolene. Over the weekend Andre took Master W out for coffee and a little poke around Shed 5 and it’s neighbourhood. We’ve been going there since before Master W could toddle around looking at the motorbikes himself, so it’s exciting to see all the new eateries appearing, in keeping with the shed aesthetic. Nice work Auckland! They came home with some photos of concrete planters, and an idea of how we can get some for our backyard. When you have something quite different in mind (like oversize terracotta pots) it can take a little getting your head around a new idea, but if it works out a lot cheaper and I can resolve the potential problem of characterless concrete then I’m in. Like these mini neon versions, a lot can be achieved with some paint. Especially if there’s some metallic involved! 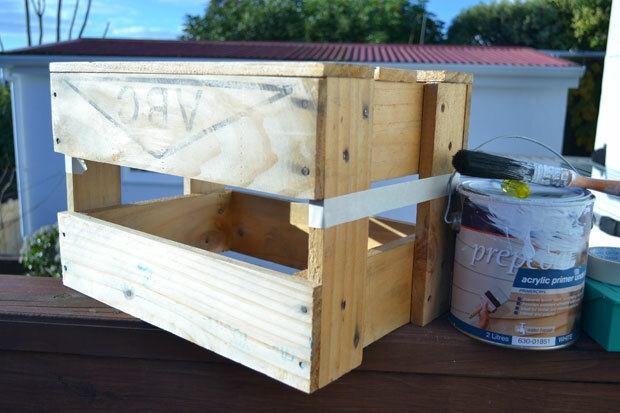 This entry was posted in Craft, DIY, Garage & Outdoors and tagged backyard, concrete, gold, metallic, paint, planter, pot on June 24, 2013 by Jolene. Did anyone guess? 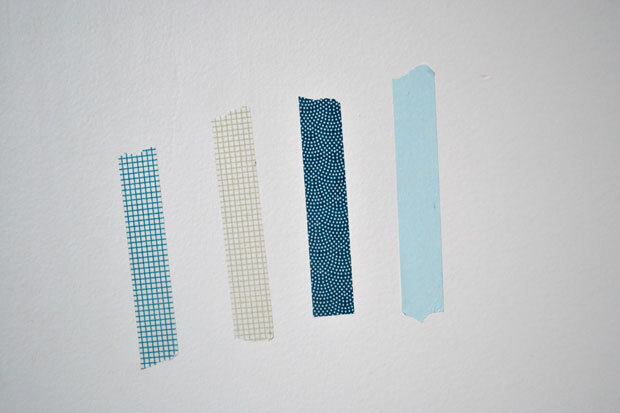 A washi project on the horizon… a skyline is a horizon of sorts yes? I started with a very. blank. wall. For the only room in the house that I consider almost done, this view is as undone as you can get. If this scares you like it does me, go take some comfort with a scroll through this. I did give this wall a wipe down yesterday. But that was it for preparation. I had my washi tape. 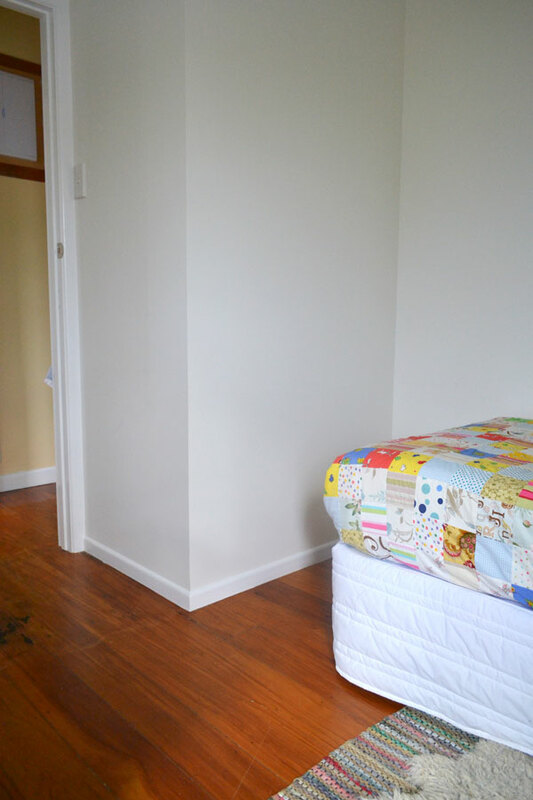 Let’s be honest – I had a choice of washi tape. These four were my narrowed down choice. I put some pieces on the wall to help me make a decision. 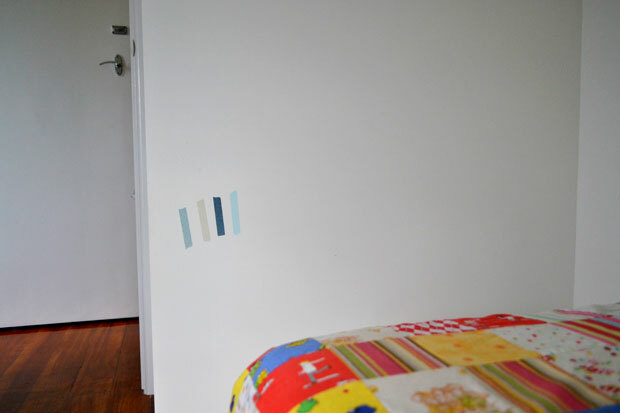 Being the boy corner of the bedroom blue was the colour of the day. The boy has pink and flowers on his quilt (although I’ve made him a manned up duvet cover for when it gets cooold), so I’m doing my best to even things out for him! I quickly ruled out #1 and #2… just because I have never liked them a lot. #4 is my favourite but I wondered if it might be too pale to make an impact, and so #3 it was. I also like the twinkly lights thing going on with #3… a twinkly night skyline? Oooh yes! 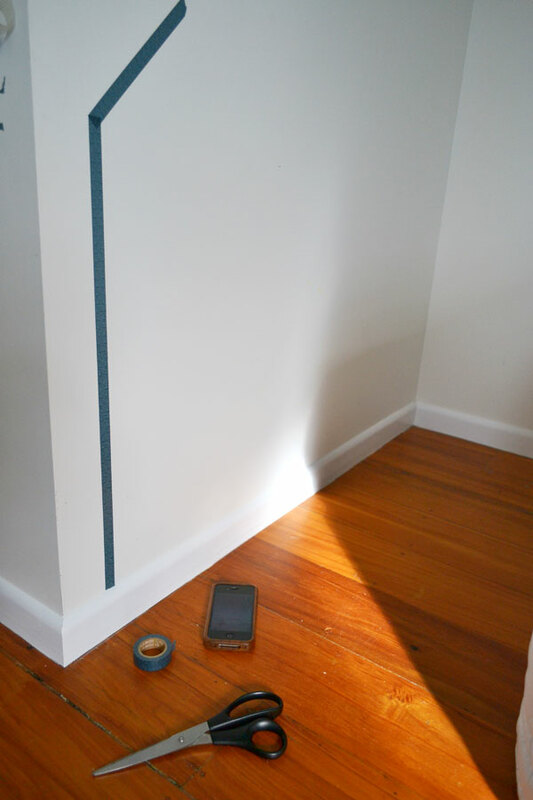 Tools of the trade: washi tape of choice, scissors (tidy cuts make the corner joins a little tidier), and a picture on my phone for inspiration. 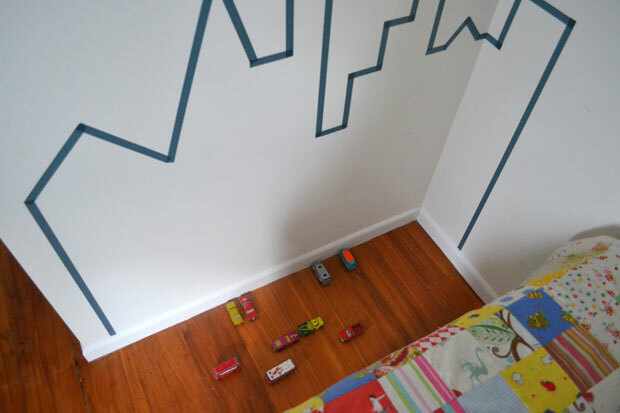 If it doesn’t charm him at bedtime then perhaps it’ll give him another little corner to play during the day! Who doesn’t need a city skyline for fire engines to roar by or tow trucks to rescue broken cars alongside? Or cuddly friends to have chats with? I know already that this will be one of those little projects that take so little time and effort, but are so rewarding. Every time I walk in that door (a million times a day!) I will turn my head and smile at the little twinkling city in the corner. And me being me, my next thought will be what else I can fill the blank space above with! In a life of so many projects that take weeks and months to finish, it helps to have these kind of 15 minute ones that make you feel like you’ve done something. You’ve started something, and you’ve finished something. All in one day! I won’t tell you what I’m avoiding so I could complete and share this with you. But I promised (next time I won’t be so foolish – and then my house might get vacuumed… oops I gave it away!) so I hope you love it! 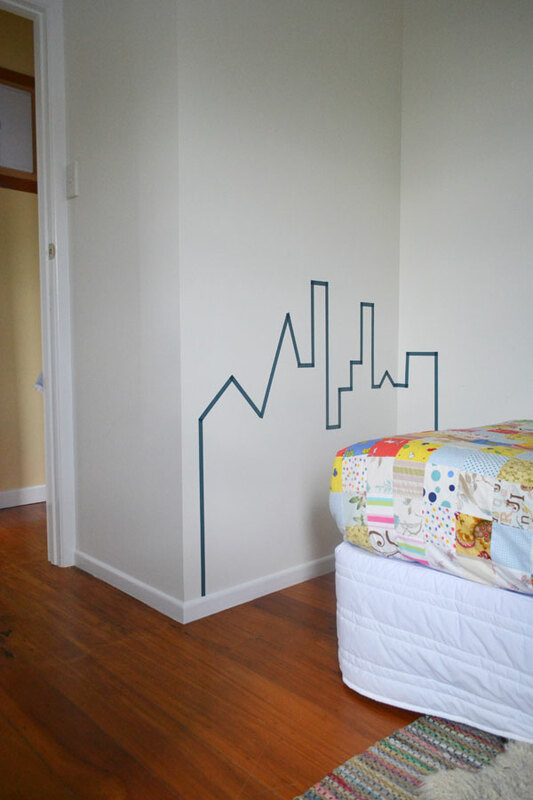 This entry was posted in Children's Bedroom, Craft, DIY, Kids, Our Renovation and tagged craft, decal, diy, kids bedroom, nursery, skyline, washi tape on June 14, 2013 by Jolene. Oooh if that title isn’t quite the clue… I have a washi project planned. It’s just a little one, and I was hoping to share it today but kids and their schedules and demands have put paid to that. Maybe I’ll get to it later and can share it tomorrow. So, with washi tape wrapping around my mind I’ve just had a little lookee over on Pinterest and found a few things to inspire. 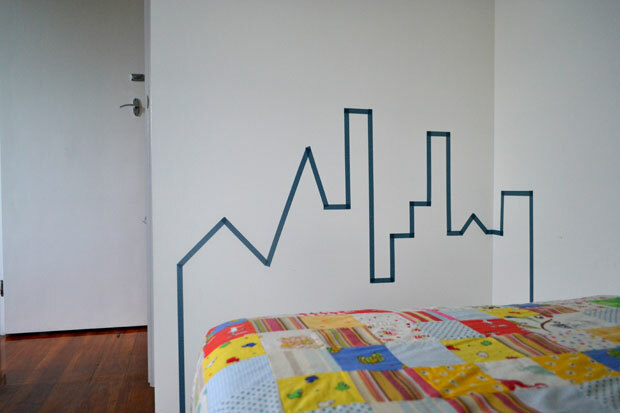 I do wonder what people did before washi tape? 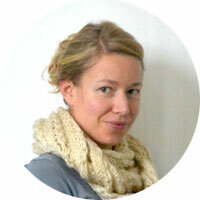 And I do wonder what will be the next washi tape… But I digress. Neon and washi tape. Love this now, will hate it later – like all good trends it will go bad real fast. 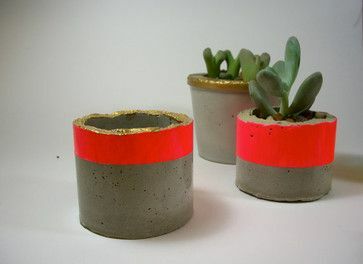 For now though – think white vessels with neon and gold tape, and I think you might have to go fake on those neon blooms, unless someone knows something I’m missing? Hmmm washi tape crosses. Simple, pleasant, easy. 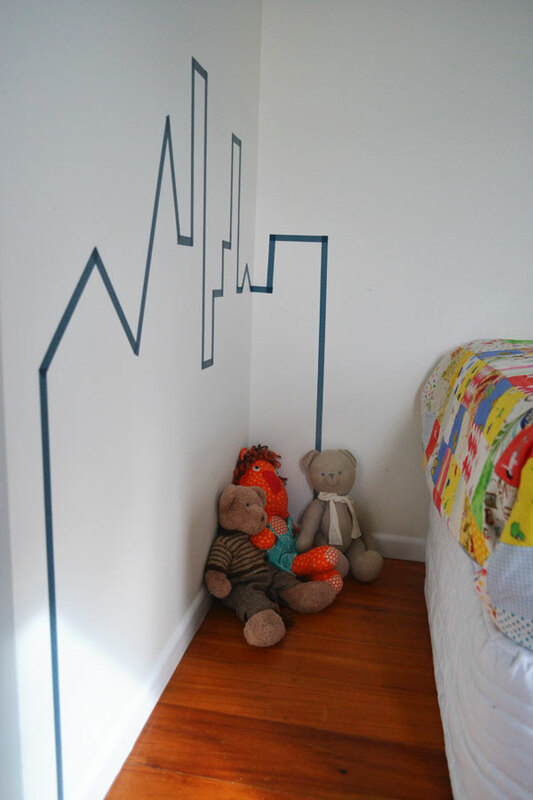 Best with solid colour tape – you’re making a pattern here, you don’t need to start with one. More neon, and while I don’t like this personally, I did want to add it in, just because of the contradiction between the traditional and the downright not. Some things just have to clash to look good. Party supplies. No self-respecting washi tape crafts round up is complete without some party element. Make your friends think you’re amazing by taking 10 seconds to wrap some tape around disposable cutlery. You could even get away with this at a small dinner party so you can forget the washing up. All pictures over on my Crafts Pinterest board. This entry was posted in Craft, DIY and tagged craft, diy, frames, neon, party, vases, wall decal, washi tape on June 13, 2013 by Jolene. It wasn’t until I was writing this post title that I realised about my PIN of the day. It’s a slow Monday. These push pins/thumb tacks/whatever else you call them remind me so much of the cutest l’il magnets residing on my fridge thanks to my lovely boys! 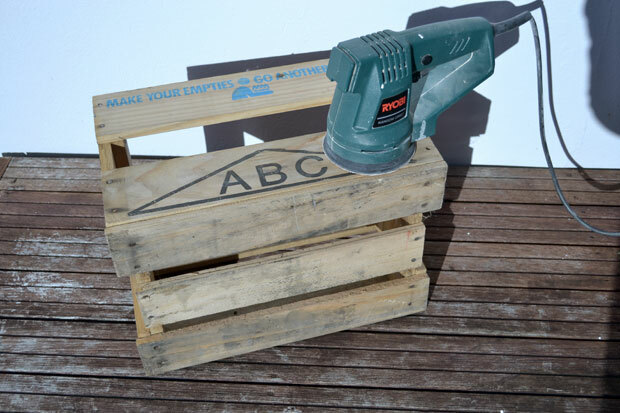 I love how the simplest (and smallest) of everyday objects can make you smile all day long with just a quick diy update. 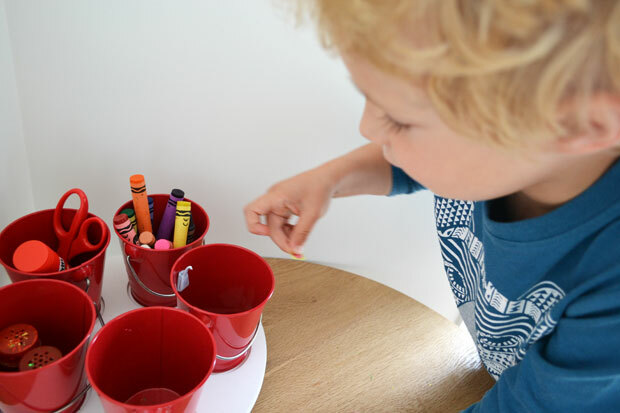 Truly – those magnets are still making my day, and even the kids can’t walk past the fridge without swiping them… I find them again in the strangest places! 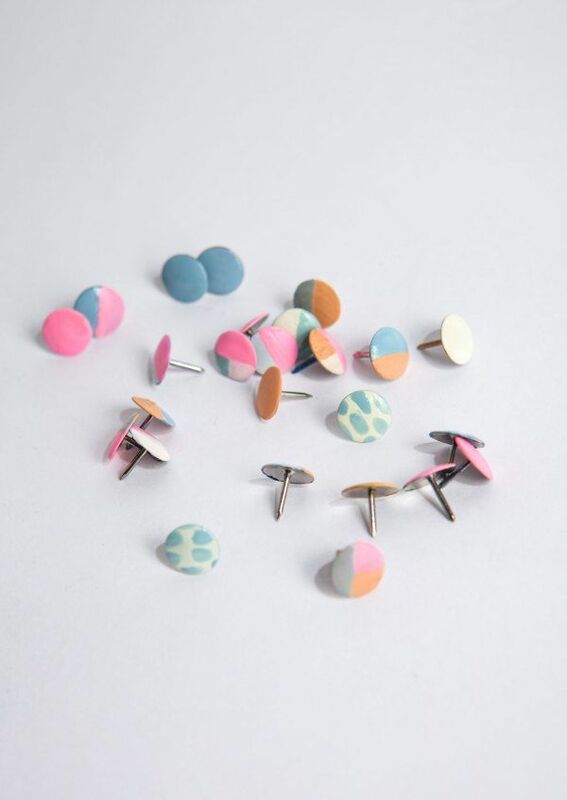 These pins have had a makeover with a few blobs of paint and some nail polish – so easy! This entry was posted in Craft, DIY and tagged craft, diy, office, pin of the day, pinterest, stationery on June 10, 2013 by Jolene.